Decorations have a long history. It is proven that awards in ancient times were given solely for military achievements. The Greeks called them “tafalara;” the Roman word was “phalera.’ Both words had the same meaning: Award. This word, “phalerae,” was used to classify the science that studies orders, decorations and their history – “phaleristic.” Some years ago, phaleristic was just an interesting field among numismatic. A Phalere was a circle or crescent-shaped plaque approximately 4 inches in diameter that was worn by war horses. Later, those plaques were mounted to the soldiers’ armor. Those phaleren are still visible on Roman tombstones. Besides the phalere, several other decorations existed. Those are the wreaths (“corona”) worn on the head, rings (“torques”) or batons (“vitis”). During the Crusades in the 11th century, knights formed into orders in a sense of a society devoted to humanity and beneficence. Their ideas came to form four knight orders. The Order of the Holy Sepulcher was founded after storming Jerusalem in 1099 and united with the Order of St. John in 1291; the Order of St. John in 1118 was formed out of the monks’ Order of the Holy John of Jerusalem; the Order of the Templar was also founded in 1118, and merged in 1312 in the Order of St. John. And lastly, in 1170, the Marianer knights Order, which later became the German Order, was formed. The cohesion among the orders’ members was determined by their rules, their congregation, the community and the orderliness (lat. ordo). The affiliation to an order was shown by their uniforms and insignia. In this regards, it should be said, all design of those insignias root in the pattern of the holy cross. Being a member of such a society had nothing to do with being awarded honors during those early days. Among the orders’ members, a ranking system was established and documented by different insignias. The grand master of these orders founded multiple branches of their order societies before the downfall of Jerusalem and enhanced their political powers in all parts of Europe . Being reinforced through all their gains during the Crusades and their fast growth, the orders’ masters were coveted by almost all of the royals. This triggered the development of awarding memberships in orders. 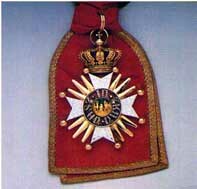 were more merit orders than knights’ societies. This change was definitely sped up by awarding the insignia of the order rather than awarding the membership to the order. The special mark of the community was awarded to an outsider for merit of all different kinds. This procedure was a step towards the modern order. During the era of absolute power, a classic knights’ order with all its rules, limited membership numbers, religious goals and so forth could not accomplish the needs during those modern times. Nowadays, knights’ societies don’t exist any more, but anonymous decorations are worn as symbols for merit. The time around the 18th and 19th century tinted by wars easily illustrates why the first founded orders were solely military orders, and the Military Order of St. Henry founded in the kingdom of Saxony in 1736 or the Prussian Pour le Mérite founded by Friedrich II in 1740. These new orders were mostly founded with three grades: Grand Crosses, Commanders and Knights, which were equal to the hierarchy of generals, staff officers and officers. This base model already had been introduced for the French order of St. Louis , issued in 1693 by Louis XIV for military merit. All famous German military orders followed the three class rule, among them the Bavarian Military-Max-Joseph Order (Form of 1806), the Baden Military Carl-Friedrich-Merit-Order (1807) or the Wurttemberg Military-Merit-Order (Form of 1818). The consolidated states were now fighting about enhancing their territories in regards to power, geographic or economic. The founded orders reflected this situation very well. Orders were mostly founded for historic wars or single battles. The Austrian Military-Maria-Therese-Order was founded in 1757 after the battle at Kolin; the Austrian Military Honor Medal was founded by Joseph II in 1789 after the Turkish war. Another step in the development of our order system was of course the French Revolution. Trying to get rid of titles and privileges during that time to make all men equal went in the opposite direction in regards to orders. In 1802 the 1st Consul Napoleon Bonaparte founded the order most known today, the Order of the Legion of Honor. This triggered a variety of order foundations. It indirectly inspired the most popular and known German medal, founded by Friedrich Wilhelm III in 1813: the Iron Cross.